All classroom sessions are carefully engineered to be inclusive and achieve learning objectives that will carry children through to their adult years. Workshops are fully resourced, highly organised and most of all reasonably priced. Professional development of our team is a priority all our team aim to remain current with the fast changing climate of healthy choices and food fashions. However the heart of our business stands strong, to excite children and enthuse them into the world of healthy food choices. Yearly service level agreements with schools have shown to have a positive impact on health and well-being indicators and is good evidence of whole school initiatives aimed at promoting health as well as strong curriculum links as part of the Food and Nutrition delivery within Design and Technology. Cookery Courses normally run for five weeks teaching the basics of preparing healthy family meals to cooking on a budget. We also explore alternative recipes such as gluten free, dairy free and vegetarian. Good news for all children who have a Learning Passport with the Children's University. We can now provide stamps for all children who attend our events and courses. Apple of my Eye, a fabulous food education service offering a variety of workshops, courses, training and advice for schools and educational settings. Click here for the latest up to date events Apple of my Eye have to offer. Send us a message or give us a call for more info on our services or to book with us. 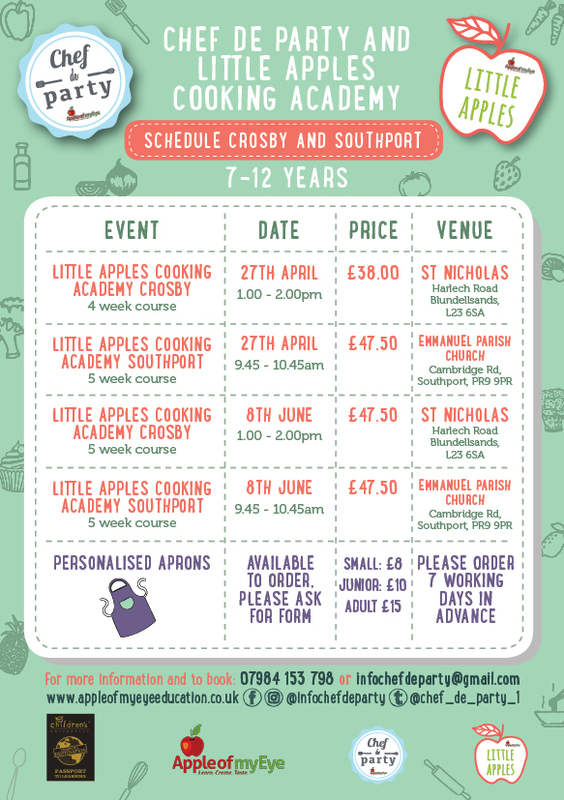 We’re excited to update you with our upcoming dates for all our Chef de Party and Little Apples Academy events and courses. Apple of My Eye are now a regular feature of our curriculum. Our children love the approach to preparing and eating healthy and tasty food. The whole federation gets involved and we have five weeks where the whole federation smells of fresh ingredients and of delicious cooking. The team plan dishes that fit in with our 'Learning Quests' and they have the right mix of experience of working in food preparation and with young children. Great value for money too! I would certainly recommend this service to any school; educational setting or community group and indeed we have used Apple of my Eye Education before in one of my early year’s settings when Michaela spent the day with our Chef teaching them better ways of cooking and presenting food to much younger children and babies. An outstanding company without a doubt. For a few years now, we have worked extensively with the team from Apple of My Eye from our Nursery aged children to Year 6. Our teaching team liaise very closely with their chefs who ensure what the children cook each week is linked to their current learning theme or topic - making cooking so much more meaningful. Our children absolutely love each session and in particular, the fact they get to take the food home to share with their family and to talk about why they have cooked it. We also host parent sessions with the Apple of My Eye team who set up in the hall for parents to learn all about healthy eating and what their children do in school. We feel this is a great aspect of what we offer as part of our curriculum. This has been an excellent investment for our school. We use sessions to encourage parental engagement and have parents attend course with their child. Everyone, without fail, has thoroughly enjoyed the lessons and, of course, sampling and taking home the delicious food! Michaela and her team are fabulous to work with, very friendly and work well with our students and parents We would highly recommend this service – money well spent! We would definitely recommend this service to other schools, the children were engaged throughout the entire lessons, they thoroughly enjoyed the opportunity to make foods that they hvaen’t made from scratch themselves before and it was lovely to see them all want to try new foods. Our classes haven’t stopped talking about their experience. I would highly recommend Apple of my Eye to deliver Food Technology to pupils aged 3-11 years. I believe that the Family cooking sessions are excellent, bringing together Lads and Dads or Dads and Daughters. The children thoroughly enjoy cooking in histrorical periods e.g Roman Feasts and Saxon.